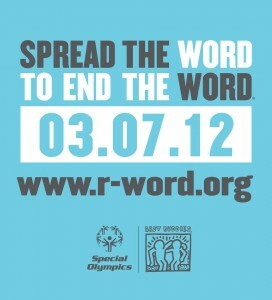 The r-word… retard. It’s a funny little slang word that can be used to describe so many things, situations…. people. It’s a word that’s causally thrown around, used without thinking about it… it doesn’t really mean anything. Perhaps, if you do not have anyone in your family that has a disability or special need… it really doesn’t mean much to you. And so you don’t get it. Why do people make such a big deal about it? Why do so many people get so upset about a word that you don’t even give a second thought to? Well, let’s fast forward a few years, actually, a lot of years and let’s say you’re now approaching your 80’s. You have children, grand children and loved ones beyond that. And then you have a stroke and in an instant… a large portion of your brain function is no longer available to you. You’re still smart, you still remember everything, you still love everyone… but now you struggle to say the things you’re thinking, you struggle to use your hands with precision…. you simply… struggle. Perhaps that’s too far off, let’s put yourself a little closer to your present self as say… 20 years off from now, where you’re now a working and capable adult and your child has just been born into the world of limitless possibilities and wonder. And then the doctor informs you that there have been complications. It’s nothing you did, it’s nothing they did… it’s just one of those things, right? Something strange happens from that point on, where you begin to see your child as a determined fighter, a winner, an against all odds victor over anything that the world can throw at them and you love them so much more for it. It wasn’t one complication… it was a life long complication that has only made you and your child stronger. Over time, you start to realize that the strange thing that I referred to earlier is actually that your perception is no longer that of your friends…. Where they still see a disability, you see strength. Where they see failure, you see success. Where they see retard… you see your child. The world hasn’t changed, you have. Now, instead of not giving that word a second thought… you do give it a second, third and fourth thought as it hurts you to the core. It now means more to you than you ever thought it could… more than you ever thought it should. And you speak up, and those kids don’t get you… they don’t understand why you’re making such a big deal about a word that they’ve never given a second thought and in that instant, you see yourself in those kids. You see what you were missing. So perhaps it doesn’t matter right now, perhaps it’s just a funny silly little word… but some day it will hurt. It will hurt a lot. Whether it’s you, your child, grand child, cousin… friend… it doesn’t matter. One day you’ll hear someone use that word and it will hit close to home and it will bother you. It will bother you a lot. It’s not a funny silly little word. It’s a stereotype. It’s a label. It’s a knife in the heart. And not to a stranger… to someone close to you, maybe even yourself. You didn’t even give it a second thought. Click the image below to learn even more and to get involved… let’s help people to understand what it really means when you use the r-word. Oh wow… I truly don’t have words for how amazing this post was. I’m not religious but… Amen to that! Yes! This is one of the best explanations I’ve ever read. Some of my friends don’t understand why things like the word “retarded” or “short bus” jokes bother me so much. This is an awesome way to explain it. If only there were a way to make everyone read it, but I know they won’t. You Nailed it Stuart..couldn’t have said it better.It hurts everytime I hear someone use the word so casually. Perfectly captured Stuart. People don’t even think about it until it effects them. Well written post, I hope you don’t mind me sharing on my FB wall. Wonderful post, Stewart. Also there is the shortened form of it, “tard”. I find that form offensive too. It’s like a racial slur.